A Christmas delight, �Twas the Knife Before Christmas will charm the stockings off readers of Joanne Fluke and Leslie Meier. It�s out of the cupcake tin, into the fire for Holly White�s best friend, Caroline. Can Holly clear Caroline�s name in time to go caroling? When a body turns up in a larger-than-life candy bowl filled with peppermints on the town square, Holly White is horrified to learn her best friend Caroline is the main suspect. Everyone in town, including Mistletoe, Maine�s sheriff, saw Caroline fighting with the victim on the night of his death. Worse, a custom kitchen knife, engraved with Caroline's initials was found with him. Now, just ten days before Christmas, Holly�s up to her jingle bells in holiday shenanigans and in desperate need of a miracle. Juggling extra shifts at her family�s Christmas tree farm and making enough gingerbread jewelry to satisfy the crowd is already more than she can handle?and now she has to find time to clear her best friend of murder. Add in her budding relationship with the sheriff, and a personal stalker dressed as Santa Claus, and Holly�s ready to fly south until springtime. But her Sherpa-lined mittens come off when Caroline is taken into custody. Can Holly wrap up the case in time for Christmas�even after she gains the true killer�s attention? 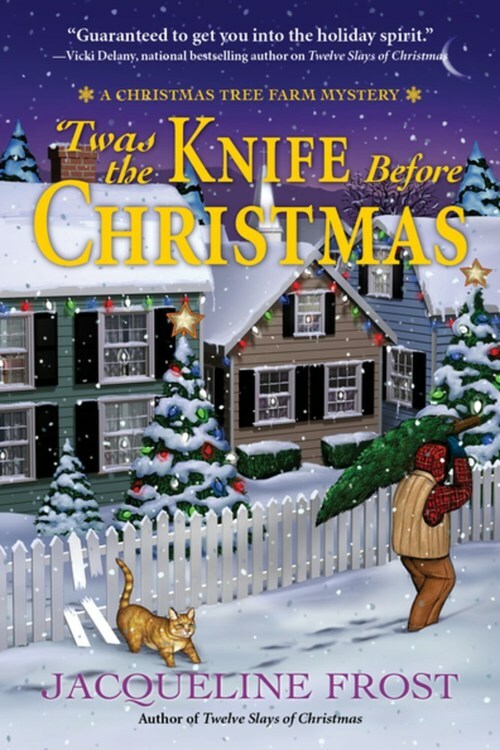 Find out in �Twas the Knife Before Christmas, Jacqueline Frost�s second pine-scented Christmas Tree Farm mystery.